The N3ZN Station consists of a CW only "Don Wilhelm built K2/100 and KAT100 antenna tuner" to a Force 12 C-3SS yagi up 50 feet for 20, 15, and 10M and a rotary dipole for 40M. A trapped 80/40M dipole is used for 80M. 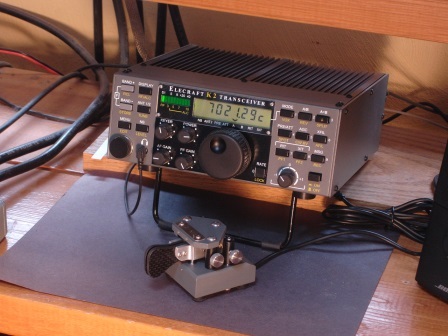 The paddle shown is a ZN-QRP with grey textured base and bearing plate, black posts and 5/16" OTO.